The Vella Syndicate is one of the Vraiterre region’s most notorious families, both of which are responsible for making the region what it is today. They have members working in both legitimate and illegitimate services across the land, all to provide the organization with a steady source of income. Despite their power and influence, the Syndicate keeps their activities quiet. This is partially out of fear of being discovered and thwarted, like Team Rocket was in Kanto, but also due to a pact they made with the Azure Serpents, their age old rivals. The two families have vowed to avoid engaging in conflicts out in the open, though this does not stop the Syndicate’s current leader, Markus Vella, from expressing his dislike of the Serpents at every available opportunity. Markus is a Vraiterre native, whose father was the former head of the family. Though his family had always intended to let Markus inherit the Vella Syndicate, they chose to keep their shady dealings a secret during his childhood, to avoid exposing him to the cutthroat world of organized crime at such a tender age. However, Markus discovered the truth about the Syndicate much earlier than expected. In his early teens, Markus inexplicably gained ability to read minds, which allowed him to uncover the secrets his family had been keeping from him. In spite of their dishonesty, Markus was not angry with them. Instead, he was interested learning more about the family business. Markus spent the rest of his teens watching his father and his associates work, preparing for when he would become the organization’s leader. He also spent this time honing his psychic powers. Over the years, his telepathy grew stronger and other abilities, such as telekinesis and ESP, manifested. 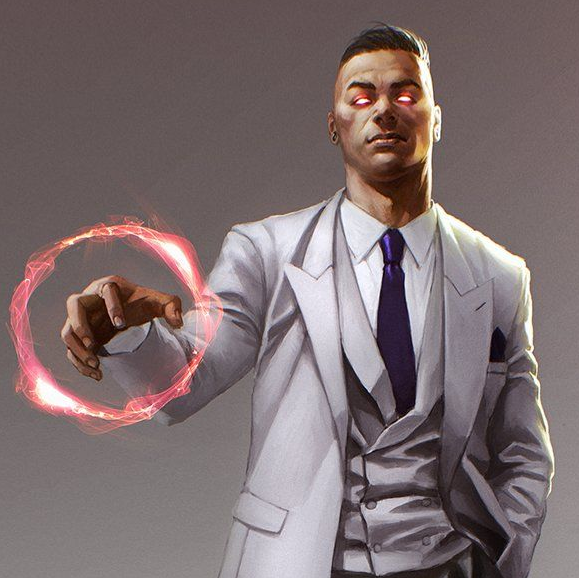 Once it came time for him to take over from his father, Markus was a powerful psychic and a master strategist, which made it easy for him to assume the role. In addition to running the Syndicate, Markus is the Elite Four’s Psychic Type expert. His fine clothes and suave demeanor make him instantly recognizable and have earned him the nickname “The Kingpin”, even among trainers who are unaware of his underworld connections. Both in and out of battle, he uses his mental abilities to get inside the heads of challengers, in the hopes that this will throw them off guard. Vera Song, a fellow member of the Elite Four and the current head of the Azure Serpents, is the only person whose mind he cannot read, much to his frustration. In spite of his formal appearance and paranormal abilities, Markus has a fondness for stage magic and sleight of hand tricks.